Information is pretty much digital these days. To manage all that digital information, you need a good information organizer. AllMyNotes Organizer is a solution you should consider for storing all your ideas, notes, financial entries, address book contacts, records, and passwords. All that personal information needs the bolt of security, and AllMyNotes Organizer for Windows locks it down with encryption. We’re giving away 30 copies of AllMyNotes Organizer Deluxe valued at $1020, plus we’re also giving away an unlimited number of special builds for the first 3 days of this giveaway! AllMyNotes Organizer is described as an outliner application. The personal information manager organizes all your information in a hierarchical tree-structure that makes it easy to drill down to the information you want. It is the same kind of organization we see with our files, folders, and directories on our computers. For instance: you can organize a project in bits and pieces of ideas, notes, resource lists, existing records etc. by nesting them under each other in a free-form tree structure. The two-paneled look of the software has that retro timeworn feel to it. But it takes nothing away from the functionality of the software. You have lots of options to customize it – choice of skins among the 16, choice of icons, and a flexible toolbar editor to personalize the interface for yourself. AllMyNotes Organizer comes localized in nearly 30 languages. Organizing information can get really complicated as it starts to accumulate. AllMyNotes Organizer simplifies it with the tree – hierarchy where you navigate down the tree to your groups of folders and sub-folders. Each folder can have unlimited sub-folders and notes within them. The sub-folders again can be branched into more folders. This hierarchy is simple to understand and browse when you drill down from top-to-down. Drag in files and folders, quickly reorder documents in the tree and even move them between folders. Organization is made more efficient as AllMyNotes Organizer lets you colorize folders and assign icons (gallery of 56) to mark out your folders. Folder previews give you an idea of the content. If any data is organized as a project, you can also add check boxes and turn them into tasks. Set reminders and alarms, and you can give your projects a time frame. Copying your data to the clipboard and pasting it into AllMyNotes Organizer is the fastest way to enter information into the application. AllMyNotes Organizer makes it slightly easier as you can use the option in the System Tray icon to capture it in the program. JPEG, PNG, and GIF files can also be inserted into the notes.You can import data from a smorgasbord of applications like Evernote, Info Select, RoboForm, KeyNote, Lotus Notes, and TreePad. Just as easily, export information freely as HTML, text, CSV, and even to PDF if you have any of the easily available PDF printer drivers installed. You can use Google like Boolean search operators to do a global search on your data and retrieve it in a flash. You can use filters to sift through the results. You can protect your valuable information by locking it with a password. Access can be restricted to your entire database file (.ddb), or to individual folders. Schedule your backups to a custom location. You can keep multiple backup files as backups do not overwrite each other. Another option allows you to delete backups that are older than a set number of days. 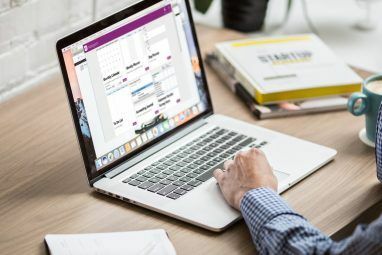 AllMyNotes Organizer does not have its own cloud-based backup, but you can easily store the encrypted contents in your Dropbox folder for automatic syncing. AllMyNotes Organizer is a very good alternative to Microsoft OneNote. Particularly noteworthy is its fast start up (because the program loads only the few kilobytes sized tree-structure first and not the entire database). 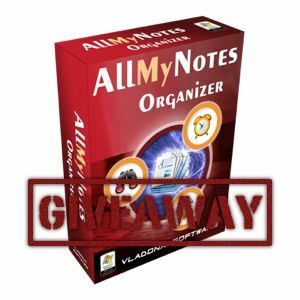 We’re giving away 30 copies of AllMyNotes Organizer Deluxe Edition, which is supported on Windows 2000/XP/Vista/7, and also all server versions. Join the giveaway to win a free copy! Congratulations! If you were selected as a winner, you would have received your license via email from jackson@makeuseof.com. If you require any assistance, please get in touch with jackson@makeuseof.com before Aug 28. Enquires beyond this date will not be entertained. This build is based on the current version of AllMyNotes Organizer Deluxe Edition for Desktop v2.65. The difference is only in the licensing and the inability to update the application. After it is downloaded and launched during the giveaway period, it will activate itself as a Deluxe edition. This will be indicated in the About window with green, bold “Deluxe license activated! Enjoy!” text. The activated Deluxe key is saved as a file named “allmynotes_b530.key” in the same folder where the application is installed. This way, you may reinstall the special build after reinstalling Windows, as long as the you keep the license file. Grab a copy of the special build by exchanging 1 MakeUseOf point. Ends Aug 23. This giveaway begins now and ends Friday, August 24. The winners will be selected at random and informed via email. Explore more about: MakeUseOf Giveaway, Note-Taking Apps, Organization Software. Hey! It's 11:22 on 8/23/12 and the download for the contest says it's over. What's up with that? It is the time-zone difference probably. It is Friday Aug 24rth in one part of the world. Are you saying the contest ended at 11am? Yes, it is only Windows. I've been using a free password manager that I downloaded from PC Magazine back in 1996 called Passkeeper that still works great. I'm going to have to pay with this one to see what it can do for me. This looks like a very helpful software. I have installed the "Special Build" and will give it a try. I have entered and liked the article. Boy, Do I ever need this one! I have SO wanted this for so long now-----even if I don't win, Thanks MUO for AllMyNotes special :-) I will be waiting in anticipation hoping for a winning email and if not.....Thank YOU!!! I hope this is good! I like softwares like this. I currently use OneNote and Evernote, but I wanna try this. I don't belong to any social network. Numerous sites, like yours, limit access to (usually only) Facebook, Twitter, etc. By definition, you have self-selected participants, which undermines your credibility when advising or reporting to anyone about anything. Check any statistical data. You are, perhaps unwittingly, taking action against freedom on the Internet. We do not have self-selected participants. Anyone is free to join and leave. We do not vet members unless they are abusive or inflammatory. The Twitter, Facebook, and G+ handles are only for the purpose of taking advantage of the free knowledge and other benefits this site tries to provide. The largest communities exist here. To give you an analogy...you live in a physical community. You are known by your name and home address. I don't think that's an infringement on independence. Are we infringing on your freedom? No. You're free to join the giveaway. You're free to join any social network you wish. You're free to choose not to. Ultimately, it's up to you but your actions have consequences and if you choose not to join a social network, you may be missing out on certain activities. This is awesome! This might be the answer to my prayers -- if I could find them!!! Well its more like OneNote. I'd like to try an organizer. This one looks good. Yeah.. maybe a good OneNote Alternative. Not really sure why I would want this when I have OneNote already but I suppose it's worth a try. Also before OneNote I found open-source RedNotebook to be pretty great too. It is just an alternative. It's always nice to have choices. RedNoteBook looks neat. Thanks for the suggestion. Great now i have 149 points. I can´t see any reference to the giveaway code required to activate the form in yours Google+ page! I can see any reference to the giveaway code required to activate the form in yours Google+ page! I can use a OneNote alternative.